Claire Dartigues was a finalist of the Redress Design Award 2017. Her eponymous brand, launched in the same year uses up-cycled materials and zero-waste patterns to construct unique womenswear for the brand’s three lines - Nouveau Paris, Collection and Couture, where multi-function and reversible pieces feature heavily. In 2018, Claire Dartigues collaborated Vent de Voyage, a Brittany based brand that up-cycles boat sails into bags to produce a cape/clutch. 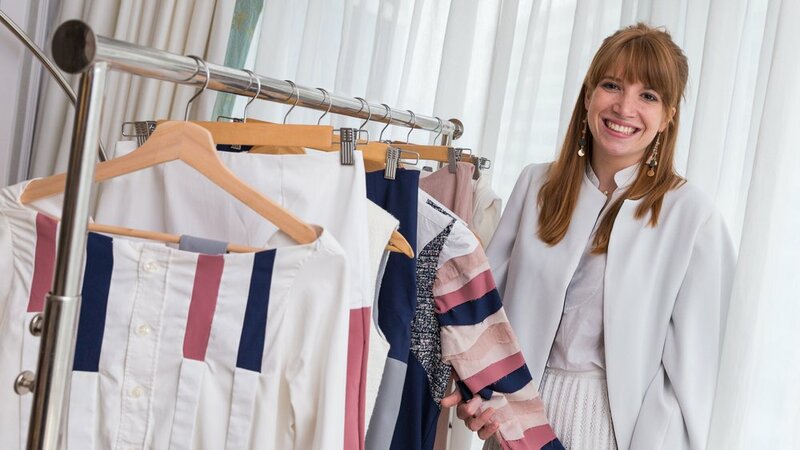 Claire was awarded the Redress Design Award 2018 Alumni Prize, winning a tailored business mentorship with independent retailer kapok, with her collection stocked in store. Claire holds a degree in Fashion Design from Parsons School of Design, New York and a Masters degree in Luxury Management in Europe and Asia from Paris Dauphine University, France. She has also showcased her work in New York at The Collective x Designow Fashion Show and Runway the Real Way where she received a rising star award. For her Redress Design Award collection (formerly the EcoChic Design Award), Claire applied the up-cycling and reconstruction techniques along with natural dyes to industry surplus clothing and textiles. The collection took inspiration from polluted rivers and set out to connect the two very different worlds of finance and blue-collar workers.